Kids stop by the Santa Booth – you can write your Christmas Wish to Santa and get your picture taken with Santa in his Sleigh. 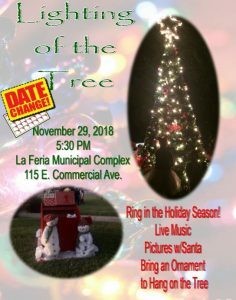 Come enjoy the beautiful Christmas Carols sung by the La Feria High School Choir. Join the tradition in hanging an Ornament on the Tree.